About the Digital Cycling Log | Shikoku Circuit Cycling | Enjoy food, tourism, and riding! The Digital Cycling Log can be used by anyone who has cycled Shikoku. 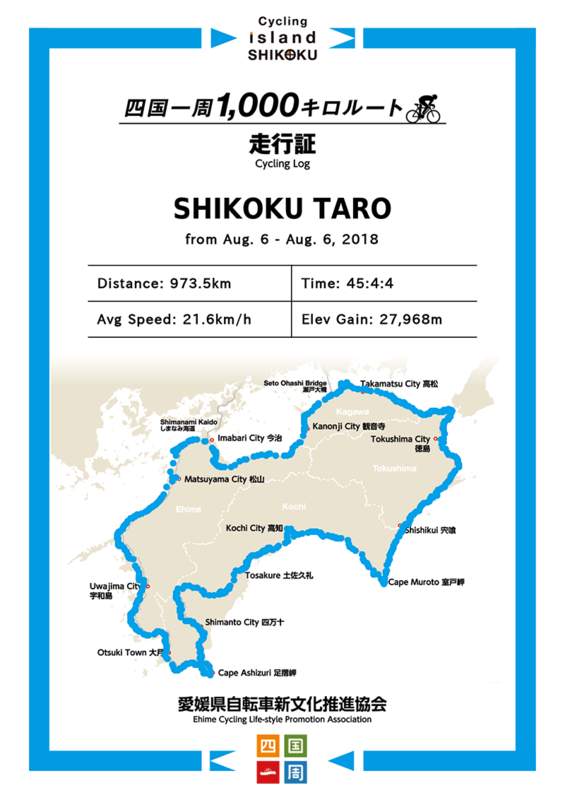 We even issue the Digital Cycling Log to those who have not completed the Shikoku circuit or who have ridden only part of the circuit. Additionally, we can issue the Digital Cycling Log any number of times, so please use to commemorate your Shikoku cycling trip. When you upload your TCX file from your GPS cycling computer, your actual route will be displayed within the map on the Digital Cycling Log. If you are not able to prepare a TCX file from a GPS cycling computer, you may have your Digital Cycling Log issued after entering your cycled distance. In this case, a prescribed Shikoku circuit map will be displayed for your cycled route. Please click the link button (Details button) in the page of "1,000 km Shikoku Circuit Route". Route data to challenge is in "Yahoo! Route Lab". You can download KML, GPX, and TCX files. Cycling data from outside the four prefectures of Shikoku cannot be loaded. It may not be possible to issue an accurate cycling log through the use of a TCX file due to file compatibility issues. Please understand this beforehand. In the event of a loading error as well you may be able to enter the data for your cycling distance manually and have a prescribed map of the Shikoku circuit displayed for the cycled route. The data for the TCX file may display a shorter total cycle distance than is displayed on your device. The data for the cycled distance may be revised and if this interests you please revise your data on the data entry screen. You will not be able to revise the display of the cycled route. Please understand that the Digital Cycling Log issued does not guarantee its accuracy. Please understand beforehand that the services of this website may not work and there may be display issues on some devices, operating systems, and browsers. Please see the cautionary points for use for this website. You may extract the TCX file using Garmin Connect if you're using a Garmin GPS terminal or specialized services or Strava’s services for other GPS devices (excluding some devices). For details please see the usage guides for each device. For Strava you can download the TCX file by adding /export_tcx to the end of the activity page web address.